World of Warcraft: Cataclysm preparation patch 4.0.1 is bringing significant changes to the way many of the game's classes function. From the end of Soul Shards to making Death Knights viable tanks, Blizzard outlines some of Cataclysm's biggest shake-ups. Cataclysm isn't just transforming the face of Azeroth geographically. Many of the class mechanics players have grown accustomed to are being changed completely with patch 4.0.1, which will be hitting live servers sometime before the expansion's December 7 release. Update: That sometime is today. That's what I get for spending all my time playing Final Fantasy XIV. 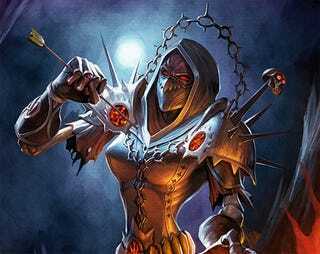 That includes the Death Knight, the game's newest class. Originally released with tanking abilities scattered across all three builds - Frost, Unholy, and Blood - Blizzard has tweaked the Blood tree to make it the dedicated tanking tree for Death Knights. Balance druids add a new day/night meter to their interface. As they cast Arcane spells the bar moves towards the sun end of the meter, eventually triggering a Solar Eclipse, buffing Nature spells. Casting Nature spells will trigger a Lunar Eclipse, augmenting Arcade spells. It's an interesting sort of seesaw mechanic that should mix thing up nicely. Hunters lose mana and gain focus, can select from five different pets at any time, with each pet family offering special buffs to parties and raids. Paladins will now build up Holy Power as they fight, which can be expended to augment existing abilities. Warriors' Rage generation will be normalized for auto-attacks, while the amount generated by being attacked is now calculated based on the Warrior's health. The most significant change as far as I am concerned is doing away with Soul Shards for Warlocks. No more shard bags, no more needing a shard to summon demons or players. Soul Shards will be a Warlock resource instead, expended via a spell called Soul Burn to augment the next spell cast. If you're in the beta and have tried these new mechanics out, feel free to sound off about them in comments. See the full list of changes in the official post on the World of Warcraft forums below.